Cox’s Bazar - On Christmas day it will be four months since the start of the influx of Rohingya refugees into Bangladesh. 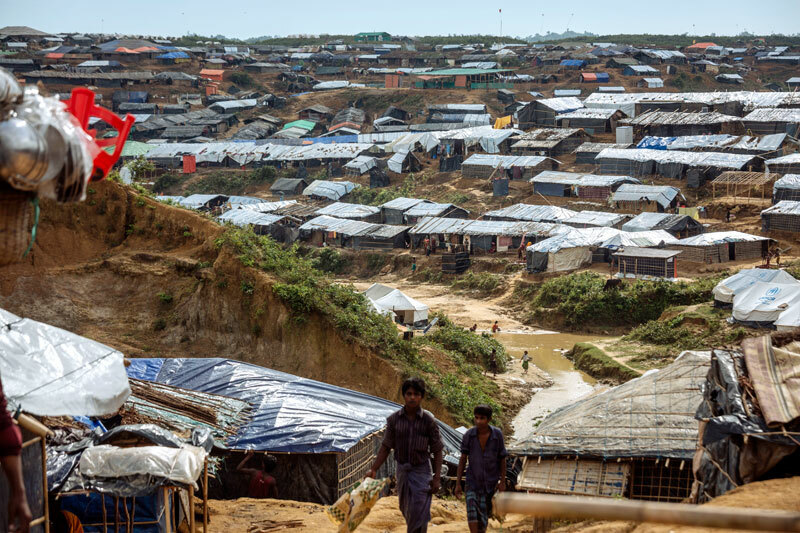 Latest figures show 655,000 people have arrived in that period, bringing the estimated total number of Rohingya in Cox’s Bazaar to 867,500. IOM’s newly-released Needs and Population Monitoring (NPM) Round 7 assessed 1,635 locations hosting Rohingya refugees in collective sites and host communities. Key findings are that 73 percent of the refugees are living in new spontaneous settlements, 13 percent in makeshift settlements, 9 percent in host community locations and 5 percent in the formal refugee camps. Compared to the previous round, there has been a reduction in the proportion of refugees in host community locations and an increased proportion residing in collective sites. As winter takes hold, IOM and its partners are scaling up their distribution of shelter and non-food items in response to the colder weather. In the past fortnight, distributions have included over 88,500 blankets and emergency shelter materials, including bamboo bundles for over 1,500 families. To date, IOM has distributed 124,000 tarpaulins, benefitting some 563,000 new arrivals. Some 32,000 people have also received other non-food relief items. IOM is also supporting the Rohingya and the affected local population with water, hygiene and sanitation. Some 1,400 cubic metres of clean drinking water have been trucked into spontaneous settlements with limited access to water and over 68,000 people have received hygiene kits. Some 1,500 emergency latrines have been constructed to date, supporting 75,000 individuals. Some 29 deep tube wells have been completed and are functional. To respond to an ongoing diphtheria outbreak, in conjunction with the Ministry of Health and Family Welfare and WHO, IOM is supporting a vaccination campaign for children under six, with community workers and support for vaccination teams on the ground. IOM has also constructed three 40-bed isolation and treatment centres to urgently increase case management and bed capacity and supporting contact tracing at several locations. As part of its ongoing response to gender-based violence (GBV) and to combat human trafficking, IOM and its partners are offering group support, including information about trafficking risks, and individual counselling sessions for female refugees in specially constructed safe spaces. Women and adolescent girls who visit the spaces can take part in recreational and psychosocial activities. IOM social workers have already identified 14,340 extremely vulnerable individuals. Some 409 individuals who faced GBV have been assisted through IOM’s case management; 3,720 have received psychological first-aid; and 1,666 have been provided with health referrals. IOM has also organized workshops run by counter trafficking experts for police and military working in Cox’s Bazar to raise awareness and sensitize them to cases of human trafficking.